It is one of the biggest slots releases of 2014 and finally Scandinavian-based slots developer NetEnt has given the great gift to the online slots world that is its highly-anticipated slot Aliens. Based on the James Cameron-directed 1986 blockbuster sequel to the original Alien movie that starred Sigourney Weaver and Bill Paxton, this slot was causing a stir in the industry ever since it was unveiled at London’s ICE conference in early 2014. Judging by the look of this slot, the hype it received was warranted. In fact, several months on, the game still holds up and is sure to be a firm favourite among real-money online slots players for some time to come. This 5-reel, 15-payline slot immediately looks slick and the background music produces an atmosphere that will keep you on edge even though you know you can’t get attacked by one of the aliens. You will still be looking over your shoulder in your own living room in suspense. The reels are packed with the creatures from the movie with the aliens in their various guises. The Wild symbol is represented by the Weyland-Yutani Corp logo and this substitutes for all other symbols to complete winning combinations. The slot is split up into three different levels. The first level is The Search, the second level is The Encounter, and the final level is The Hive. It is possible to win up to 570,000 coins playing this slot so you know from the very start that there is some serious cash up for grabs on this title. Right, onto the three levels. You begin playing this slot on The Search level. The aim of this level is to fill the Alien Activity Meter with the highest multiplier values. This helps to set you up for some potential massive wins in level two. 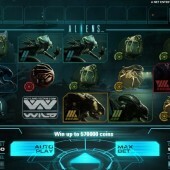 Multipliers up to 14x will be added to the Alien Activity Meter after each winning combination. On this level, I found it was easy to secure small wins here and there but it was tricky to progress to the second level. Constantly I found myself falling short of the multipliers required to progress so even though I was winning frequently, the winnings were barely covering my bets so I felt like I was going nowhere. On level two, The Encounter level, is where you are subjected to a huge alien attack in the role of a marine working their way through a dark corridor. 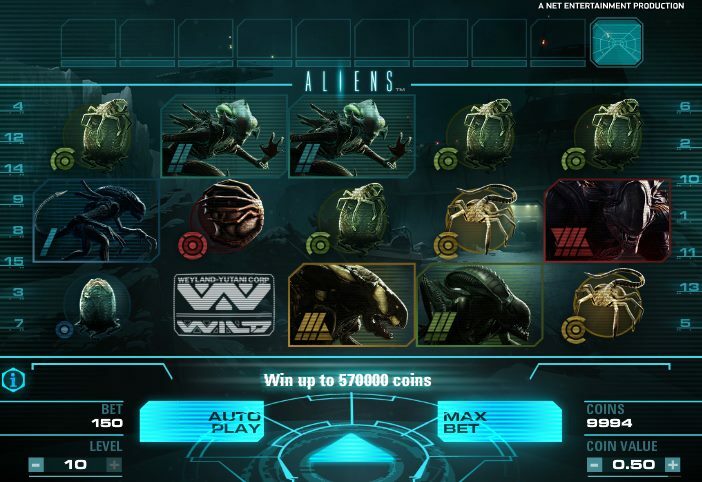 Every win you hit will depend on what the multiplier selected in the Alien Activity Meter is valued at. After every spin, your marine character will shoot at aliens but he will need ammo to do this. You can collect ammo from the dead marines on the floor but if you run out of ammo the level ends and you return to the base game and level one. If you survive this level then you will progress to The Hive. Finally, Kill the Queen and Win the Jackpot in The Hive! Once you reach the final third level, The Hive, you will be awarded with 5 free spins where you must attempt to kill the Queen alien with grenades in order to win the big jackpot prize. You really need to get your Ripley on in this finale if you want to win 240x your bet. I have to say that I was expecting big things from this slot before it was released and even when I started playing it my initial reaction was that the look and feel of this slot was sublime. However, the gameplay can be slightly confusing for new slots players with the different levels and it might not even be to everyone’s taste, even if you’re a veteran slots player. At first play, this slot will scare you with the amount going on but once you get to grips with it you will see that there is a lot more to Aliens than meets the eye. I loved the Aliens movie and I love this slot. Why not give it a try? Fans of NetEnt’s Creature From the Black Lagoon are certainly advised to give this slot a play.